First of all…thanks to Mephitblue for his excellent Poconos Ski report. I had planned on stopping at Roundtop on my way up I-81 to visit family in NY. After reading his TR I diverted to Elk instead for a few hours of Skiing. There was a cold rain all the way up I81 but I was banking on altitude helping me out and it did. The rain turned to snow at about 1400’. The fog was a bit of an issue…especially near the top of the mountain. I stayed off expert slopes for the most part because it was hard to see the bumps and the people I did see seemed to be struggling. They have some nice twisting blues that were just fine. I especially enjoyed two trails named Kickapoo and Schuykill. It was fun coming out of the fog and the layouts of the trails allowed you to let your skis run on the narrow straighter parts as there were nice wide race track type turns. In summary, I would go back in a heartbeat. It is a relatively easy trip once you get yourself to I81. From Richmond about 6 hours via DC. I would consider this a good alternative if you can’t make the drive up to Vermont. Probably about the same distance as Hunter Moutain but not having been there I cannot compare the two. Elk is great. And Kickapoo is indeed the best trail on the mountain, especially when it’s empty and you can blast down it taking advantage of the tight banked turns. Where did you see a sign about a high speed quad? I didn’t notice it the last two weekends while I was there. And I’m not sure I think it’s a good thing. What they really need is a ticket booth at the base of the quad. I hate riding that stupid deathtrap of a truck. a detachable quad gets no more people up the hill than a normal quad. they both can operate at 2400 people per hour no matter what, Dont doubt me till you ve done the math. Yes, I can do math. And that is true, only with the assumption that all chairs are full. It would be more about the clientele. I would fear a high speed lift might be the first step in changing the mountain into a destination resort that would attract a lot more people from NYC and Philly and make the place as crowded as the more southern Pocono areas. I will never go to Camelback on a weekend again. Hey, I’m glad my report inspired you to visit Elk GRK. 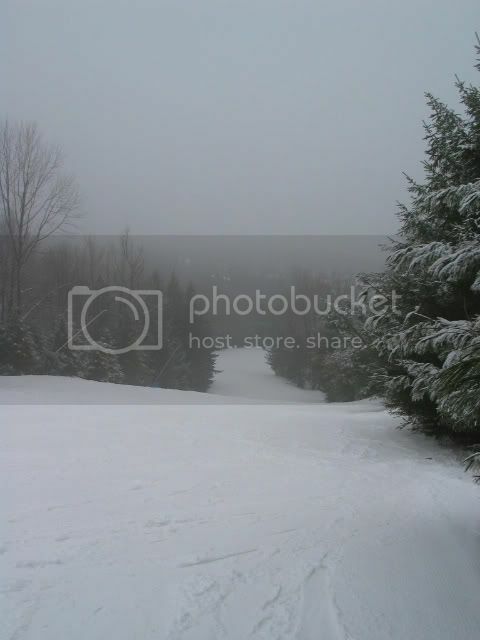 Good photos, they capture of a foggy day on the slopes as well. I think a high speed quad at Elk would be nice as well. True, it may attract more clientele, but I don’t think it will ever get as crowded as Camelback. 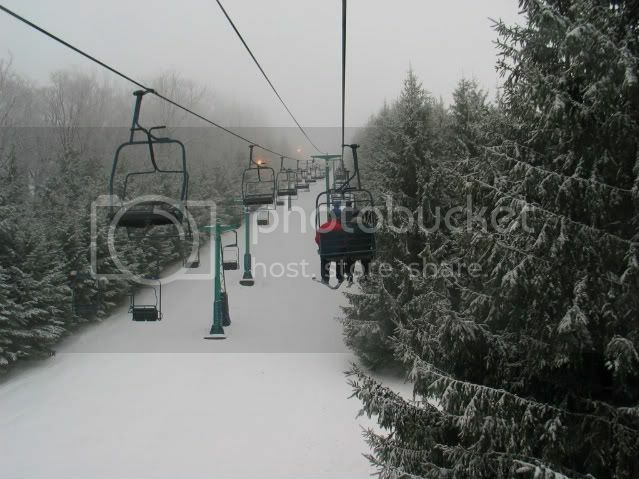 Camelback is one of the easiest ski areas to get to in the Poconos and it has a lot of hotels and restaurants right next to it. There was a large map outside the ticket office pointing out the quad lift on it. Maybe it just said Quad Lift. It is possible I misread it. As for a high speed quad attracting more crowds, well, it might. But that is a calculation the resort has to do for itself. Once you make a capital improvement you need to recover the money somehow. Maybe THEIR math says we can keep doing what we are doing and come out just fine. Either way, its a nice place. Elk and Plattekill are two areas I’d love to try. Problem is, both are pretty inaccessible from DC; given the time it takes to get to either one, there are better destinations closer or with just a bit longer drive. I have to add Ski Denton to that list. Yes, but by moving slow through the loading and unloading areas a detachable generally has fewer wrecks, and thus more actural uphill skiers per hour than a non detachable lift. 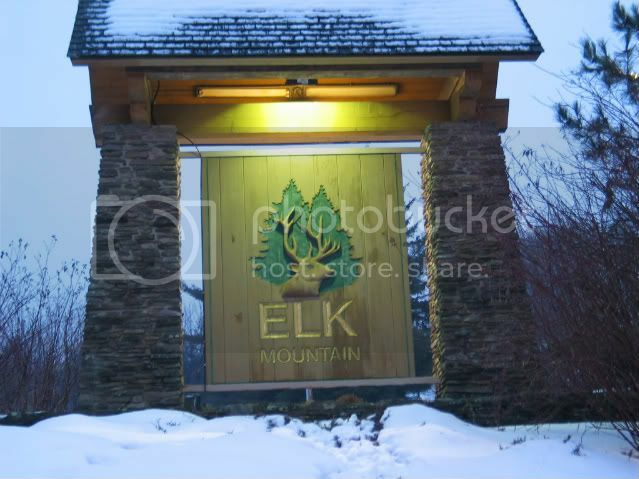 I was just at Elk this weekend!! Great place, love racing there! Snow was fantastic but unfortunately rain/fog moved in and canceled second half of the day today and is currently in the process of destroying their base. Love the resort though, great terrain! I had this discussion with some folks while riding the t-line high speed this past weekend. I highly recommend Elk to anyone heading up I 81 to New England. It’s worth the stop. Yeah the lifts are slow, but on what appeared as a busy Sat., I never waited in line, and more importantly, lift stops were very infrequent. HSQ would only make the looping differnce. They’d be better off just upgrading the doubles to quads. No gaper issue here—one of my main observations is that all the skiers and boarders were in control, even on the blue cruisers. No fly bys, yard sales or plowers, and also some of the best tele skiers I have seen in the Mid-A with the exception of TL. This place is groomer central. Only two runs were bumped up. The steeps are fine but nothing too challenging, but most of the trails have some headwall near the top, some longer than others. You missed the real bumps. Tunkhanok under the quad is usually a massive mogul field. They had to flatten it after the rain because it became dangerous. It’ll be all bumps in a few days. Though it was very nice groomed with a ton of man made on it. 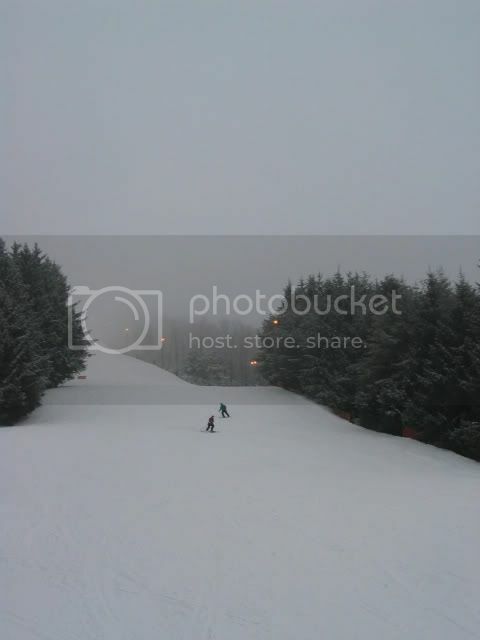 Might be the first time I was able to ski it in under 5 minutes. I agree that the skiers there do tend to be a bit better than average. The crowd tends towards more dedicated skiers since it’s a bit out of the way. Also, there’s no planned lift enhancements as far as I could tell. The sign by the ticket windows that says "New Quad" is years old and referring to the existing fixed grip quad.